AN AMATEUR snooker player from Didcot has continued his remarkable green-baize comeback by winning his second successive tournament on an over-40s circuit. Neil Craycraft took the honours in the eighth and final leg of the Cuestars South of England Seniors Tour on a dramatic day at Waterlooville Sports Bar. Beaten finalist John Hunter (Andover) clinched the rankings title. Phil Morgan (Salisbury) was crowned Masters champion. And a record three centuries were recorded. Craycraft returned to the Cuestars circuit after an absence of nearly seven years to win the fifth leg on home tables at Jesters Snooker Club, Swindon, in January. 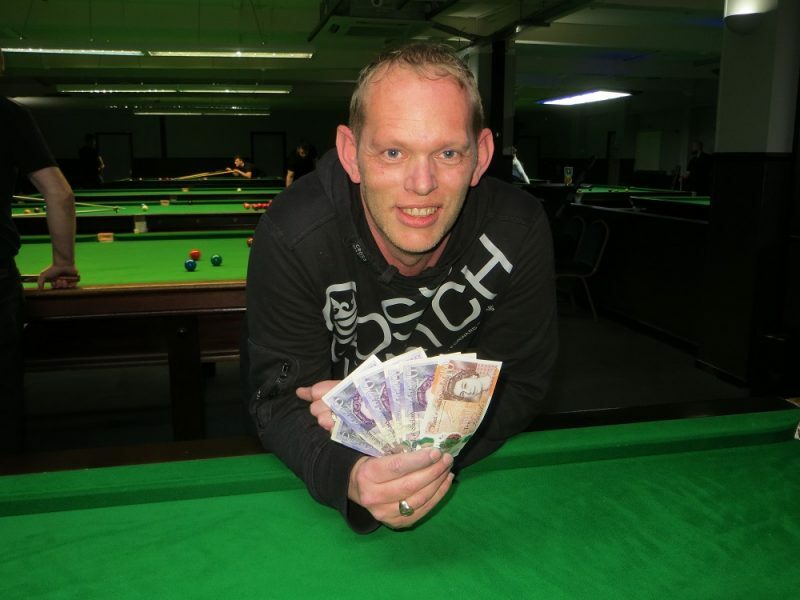 The 45-year-old lorry driver was in full flow as he overcame Hunter 2-0 in the final to pocket £110 prize money. He snookered himself on the last red on a break of 72 in the first frame and secured the second with runs of 46 and 55. Reflecting on the day, he said: “It’s been good. The tables have been good and I’ve been scoring heavily, which is nice. “I’ve been working a bit on my game over the last couple of months in preparation for next season’s Legends (World Seniors) Tour. The hard work is starting to pay off at long last. Meanwhile, Hunter set up a title decider with Matt Ford (Bracknell) by edging Simon Dent in an epic and mentally draining quarter-final. Trailing 1-0 to the debutant from Brighton and with one red left in the next, Hunter produced a pressure clearance to square the match on the black and won the decider on the pink. The 52-year-old said: “Simon’s a real hard player. I really don’t enjoy those kinds of games. I’m battling mental demons to keep myself going. He then took the lead against Ford with runs of 32 and 26 but his opponent, who missed out on the title last season on countback, responded with a 50. Hunter won the title in 2011/12 and 2012/13 and shared it with Wayne Muddiman (Southampton) the following season before Mike Talmondt (Portsmouth) won three on the bounce. Morgan claimed the Masters title for being the highest-placed player aged 55 or over. Stephen Hills (Northfleet), who was pipped for the title last season by David Stewart (Odiham) on countback, was runner-up again. A high-quality field of 21 returned 33 breaks of 40 or more. And that total included a record three centuries, eclipsing the two recorded in Chandler’s Ford in the sixth leg in February this year. Colin Norton (Gosport) kicked off the high-scoring event that was sponsored by Kara Accountants with a 100 in his first frame of the day against Herman Desmier (Wimborne). It means the local legend has knocked in tons in the last three Seniors events he has entered – albeit over a period of five years. Craycraft then made a 101 in his first match against Neil Herd (Frome). But Ford topped that with a 107 against Andrew Darken (Feltham). The top-20 ranked players will be invited to compete in the Seniors Championship at The Crucible Sports & Social Club, Newbury, on Sunday, April 29. For more information about Fawley-based Kara Accountants, go to www.kara-accountants.net. Matt Ford: 107, 60, 53, 50. Neil Craycraft: 101, 80, 72, 71, 63, 55, 52, 46, 46, 43. Colin Norton: 100, 60, 47, 46, 43. John Hunter: 71, 66, 61, 45, 41. Simon Dent: 62, 60, 45. Paul Norris: 50, 47, 46, 44. GROUP A: 1st, Matt Ford (Sunninghill Comrades Club, Ascot); 2nd, Andy Norman (Castle SC, Brighton); 3rd, Martin Wallace (Crowthorne RBL); 4th, Andrew Darken (Chertsey SSNR Club); 5th, Paul Burt (Salisbury SC); 6th, Richard Arnold (Salisbury SC). GROUP B: 1st, John Hunter (Salisbury SC); 2nd, Neil Craycraft (Jesters, Swindon); 3rd, Neil Herd (Salisbury SC); 4th, John Monckton (Woking SC); 5th, Stephen Hills (Traders, Northfleet). GROUP C: 1st, Paul Norris (Castle SC, Brighton); 2nd, Simon Dent (Castle SC, Brighton); 3rd, Steve Ashton (Salisbury SC); 4th, Dan Hammond (Chandlers Ford SC); 5th, Jean-Marc Bancilhon (Camphill Social Club). GROUP D: 1st, Neil Carroll (Chandlers Ford SC); 2nd, Colin Norton (Sarisbury Social); 3rd, David Stewart (Chandlers Ford SC); 4th, Herman Desmier (Bournemouth & District Constitutional Club); 5th, Phil Morgan (Chandlers Ford SC). QUARTER-FINALS (12 points): Ford 2-0 Norton, Hunter 2-1 Dent, Craycraft 2-0 Norris, Norman 2-1 Carroll. SEMI-FINALS (£25, 15 points): Hunter 2-1 Ford, Craycraft 2-1 Norman. FINAL (£110/£50, 25/18 points): Craycraft 2-0 Hunter.